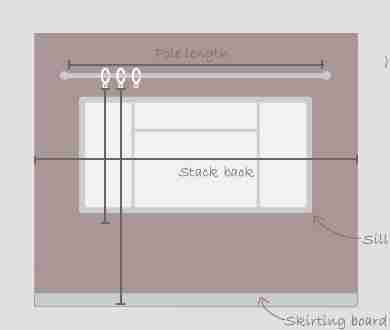 Position – the curtain pole or track should be positioned 10cm above the window and extend 15cm-20cm either side. Width – measure the length of the pole or track (not the finials of a pole) and add 20cms toallow the curtains to overlap and spring back. Drop – curtains that fall to the sill should finish 15cm below the sill or just above a radiator, while floor-length curtains finish 1cm from the floor. Curtains that drape onto the floor will need an extra 13cm added. Pleated headings (pole) – to prevent the pole or rings from being obscured by the curtain, measure the drop from the eye of the ring (this is the small metal loop at the bottom of each curtain ring). Pleated headings (track) – measure the drop from the top of the track rings and the bottom of the curtain ring, you will find that the depth of track will vary. Curtain tape allows for any adjustments, enabling the hooks to lie in the right place for the curtain rings. Eyelet curtains – measure from the top of the pole to the desired lengthand then add the following lengths depending on the size of eyelets you’ve chosen. This allows for the eyelets to be inserted. 60mm eyelets – add 6cms. 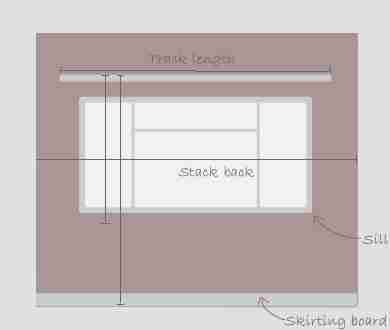 Measuring bay windows – is tricky, but if you would like to have a go then just contact me for a simple ‘How to’ guide. It is very important to measure each window carefully as this ensures the curtains fit properly. If in doubt please check again. Carol’s Creations will not be responsible for measurements that are supplied incorrectly. Call today to discuss your project in detail and arrange your FREE design consultation. Ibeaque cus, tem qui bea voloresciet harcill audam, que nonsend untore dellaborem exped et repero miliquo voluptus eatem id quo consequat eos aut. Tion preprat emporerferis ut voles endipsum eostem aut imet am quodiae dusant quid quam que. dusant quid quam que.